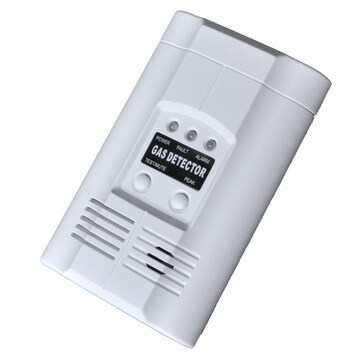 The gas detector is designed for single station use or for connecting to fire alarm or security alarm panel. Small and compact, the design and color makes it ideal for use in the home, small commercial properties, and recreational vehicles. It is intended to detect leakage of natural gas (methane gas), town gas, and bottled gas (propane gas), coal gas. The unit is designed for AC Powered plug-in applications. The gas detector can bemounted high (for methane gas) or low (for propane (LPG) gas). It is equipped with a sturdy metal mounting bracket for quick, easy, and secure installation. 1. Detect all sorts of combustible gases, natural gas (methane), bottled gas (propane), LPG (Liquefied petroleum Gas), LNG (Liquefied natural gas), coal gas, including town gas. 2. Easy to install, mounting bracket included. 3. Loud 85dB alarm and LED warning light. 4. High quality durable sensor. 5. Self diagnostic function by MCU intelligent software. 6. Excellent reliability & High stability. 7. Ideal for all kitchens.